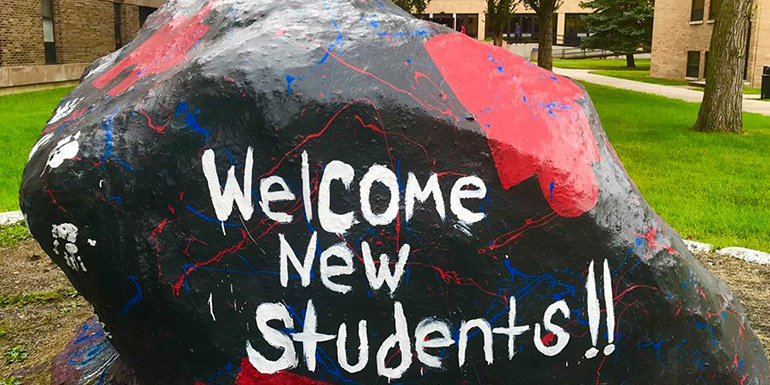 The Rock has a message for all people new to the Detroit Mercy family. You’ll see lots of photos on social media and on phones from coworkers who straggle in late today because it’s a national holiday of sorts — the first day of school! Classes at Detroit Mercy started last week, but we still want to share our photos of the day, as they mark an important occasion. This is the University’s 141st academic year and we have a freshman class of about 600, our fourth year of growth. As usual, our first-year students were introduced to the service values of the Jesuits and Religious Sisters of Mercy during orientation by working in the neighborhood. Some alumni joined in, too. We hope these bring back good memories of your time at University of Detroit, Mercy College of Detroit and University of Detroit Mercy.